As the name ‘Awareness Course’ suggests, this course is designed to brief you on The Open Group’s IT4IT standard with need-to-know coverage. It might be that your organization is implementing the standard, or is considering to do so. You may be a decision-maker, or a potential user. You might be an IT professional, an HR executive, or an accountant. Whatever your background, the IT4IT standard is something you need to be aware of. Released in Q4 2015, The Open Group’s IT4IT standard is a prescriptive reference architecture for managing the business of IT. Utilizing the value chain concept, the IT4IT standard supports the essential principle of running IT like a business. Although this course does not itself lead to any formal qualification or accreditation, it will put you in good shape to consider engaging in Good e-Learning’s accredited IT4IT Foundation (level 1) training, available self-paced and online. The Foundation course does lead to formal accreditation, and includes the exam voucher, practice tests and tutor support. This course is designed to brief you on the IT4IT standard in as much detail as you deem appropriate. Completing section one will give you a good idea of what the standard is, and why it is important. If you require more technical detail, you can continue to section two, which really gets into the nuts and bolts of the IT4IT reference architecture. Section three offers a much closer look at the potential benefits of employing the IT4IT standard, and in section four you will have the opportunity to further investigate the benefits of the standard according to your role in the organization. Why Study IT4IT Awareness With 4PA? Quite simply, the IT4IT standard reduces cost, simplifies, and brings end-to-end traceability to your IT production. It enables IT management to work across the entire Value Chain in a better, faster, and cheaper way with less risk. It’s the obvious solution. More successful projects (or making it more likely that IT initiatives will realize their expected benefits). Improved stewardship and control of IT Investments by linking investments in IT to business drivers and business benefits. Improved selection and prioritization of projects and IT initiatives, highlighting those that provide the highest business value. The faster delivery of fixes or patches to resolve production problems. Reduced development and maintenance cost due to better control on customizations and configuration changes (for example, preventing the building of features that are not necessary or have a low business value). …Improved customer experience and satisfaction. Faster delivery of requested services with fewer errors (resulting in less rework and incidents). Fewer unplanned/ad hoc activities or emergency changes. Less need for users to call the service desk, and reduced support costs, by providing self-service and self-help capabilities to the user community. This eLearning course covers the full case for a new prescriptive reference architecture and discusses in detail, the challenges faced by current IT management in the age of digital disruption. At points during this IT4IT Awareness course, you will be asked questions that will help you retain your knowledge of the IT4IT standard, and to help you think about what you have learned, and how it might’ve changed the way you think about your work environment. Knowledge checks appear at the end of each topic, and there is a comprehensive quiz at the end of the course. Module 1: What’s the story?  What is IT management and the IT4IT standard?  Why use the IT4IT Reference Architecture? 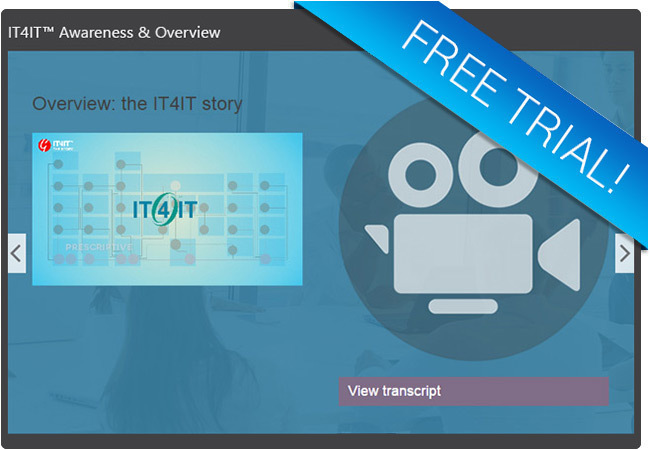 In this free trial module, we are given an introduction to the IT4IT Reference Architecture, we look at the IT Value Chain, and we’re offered a brief narrated video introducing the background and key concepts of the IT4IT standard. Finally there are five multiple choice questions to help you retain the knowledge and check your understanding. The full IT4IT Awareness course comprises four modules, each consisting of six sections, and over one hundred multiple choice questions. 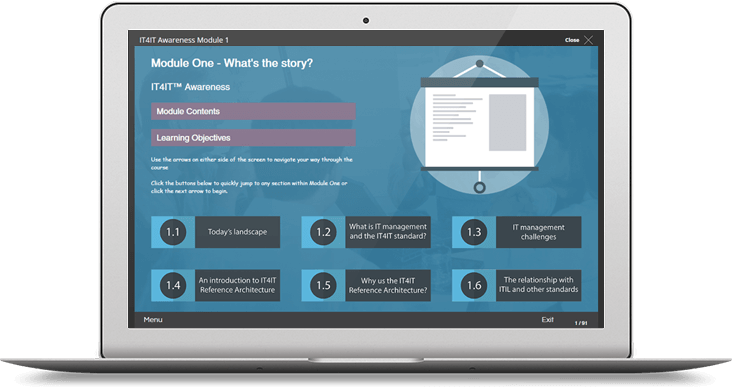 Like the full IT4IT Awareness eLearning course, you can access this free trial module from any device whether you are at home, at work, or on the move!